Preheat Pizza Stone in oven to 500 degrees with corn flower to keep pizza from sticking. Use fresh shrimp and place in Ziploc bag in olive oil and season to your taste, Sriracha, or teriyaki BBQ sauce are very nice. Spread pizza dough on pizza peel with corn flower under so it slides off easily. 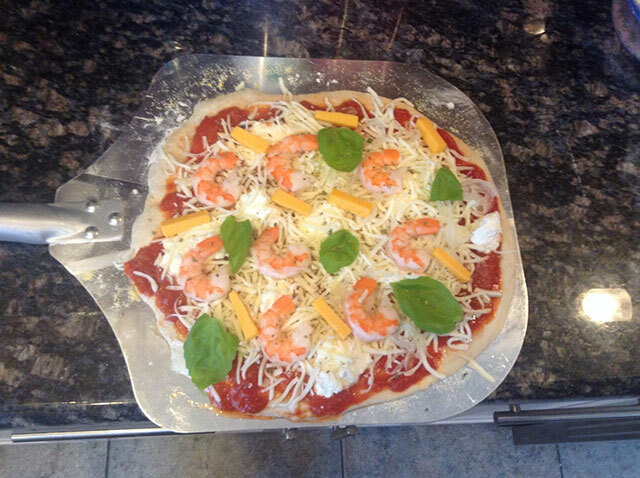 Add tomato sauce then plop with teaspoon ricotta cheese and add shrimp, sprinkle on shredded cheese, mozzarella and cheddar is best, but you can add your favorite, add fresh basil. Slide on to preheated stone in oven. Cook in oven for 15 minutes or until cooked to your desired taste and preference. Slide pizza peel under to remove and serve. Best if served with your favorite beer in a frosted mug.